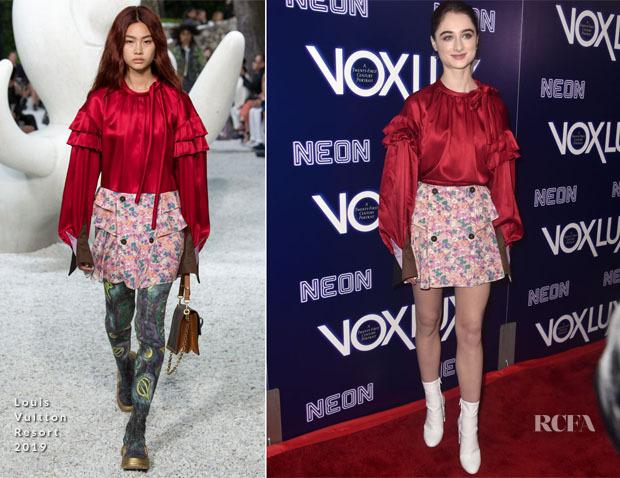 Raffey Cassidy continued the ‘Vox Lux’ promo circuit at the film’s LA premiere on Wednesday (December 5). While I will make no argument against her skipping the patterned tights and lug-sole shoes from the Louis Vuitton Resort 2019 runway, I wasn’t quite sold on the white go-go boots she replaced them with. That said, I can kind of see that she perhaps chose the signature booties on behalf of the retro, ditzy-floral skirt. But, they still drew a lot of attention downwards — and away from the richer, rosier tones of the look. Although, some of you may be applauding such a thing as the oversized, blouson top is likely a Marmite element, too. Are you loving this LV look — or quite the opposite?